Based in Newquay, with visits to, St. Ives, Truro, Falmouth and The Cornish Cider Farm. 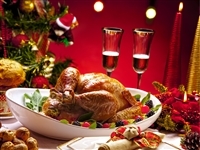 As with every Turkey & Tinsel you will enjoy a traditional Christmas dinner, a visit from Santa, evening entertainment including a free bar between 6pm-9pm each night (selected brands only) with plenty of Cornish hospitality, this tour makes for a wonderful pre-Christmas holiday. Tuesday  We begin the day with a visit to Cornish Gold. We continue to the beautiful resort of St Ives for lunch and to complete the day, we visit the Cornish cider farm with an opportunity to taste and purchase some real Cornish cider! Return to the coach for a complimentary cream tea. Wednesday  A free day to explore Newquay or a chance to simply relax and enjoy the spa facilities in the hotel. Friday  After breakfast we leave our hotel and visit the popular Trago Mills before we head back to Wiltshire after a relaxing break. With stunning views of the bay this hotel offers excellent leisure facilities, comfortable bedrooms all en-suite, with hairdryer, TV and hospitality tray.